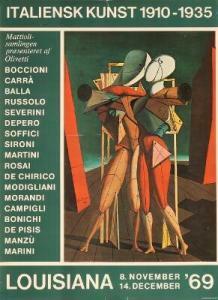 Find artworks, auction results, sale prices and pictures of Giorgio De Chirico at auctions worldwide. IL VATICINATORE Giorgio de Chirico 1888 - 1978 signed G. de Chirico and dated 1914 (towards lower right) oil on canvas 60 x 46 cm; 23 5/8 x 18 1/8 in. Painted in1944. A. Zodo, Milan Galleria dello Zodiaco (Linda Chittaro), Rome Galleria Gissi, Turin Private collection, Europe (acquired from the above in 1998 and sold: Sotheby's, London, October 12, 2012, lot 9) Private collection, Europe (acquired at the above sale) Acquired from the above by the present owner Exhibited Rome, Galleria dello Zodiaco, Beckmann, Braque, Dali, de Chirico, Ernst, Laurencin, Picasso, Severini, Vlaminck, 1944 (under the title Vaticinatore con torre rosa) Turin, Galleria Gissi, I protagonisti, 1982 Milan, Galleria Philippe Daverio, Giorgio de Chirico,i temi della metafisica, 1985, no. 28, illustrated in the catalogue n. p.(under the title Vaticinatore con torre rosa) Literature Claudio Bruni Sakraschik, Catalogo Generale Giorgio de Chirico,opere dal 1931 al 1950, Milan, 1987, vol. VIII, no. 748, illustrated n. p. Maurizio Fagiolo dell'Arco, I bagni misteriosi, De Chirico negli anni Trenta, Parigi, Italia, New York, Milan, 1991, illustrated p. 37 (titled Vaticinatore (con torre rosa) Catalogue Note "What I hear is worth nothing: it is only what my eyes see when they are open, or even better, closed, that counts." Giorgio de Chirico in André Breton, Le Surréalisme et la peinture, Paris, 1928, p. 38 Il vaticinatore is a remarkable example of one of Chirico's most intriguing themes: the fortune teller. This theme particularly interested Thrall Soby, art critic and connoisseur, whose support and knowledge contributed to building Chirico's international reputation and whose significant bequest to the Museum of Modern Art in New York consists of two major examples of this subject: The Seer (1914-1915) and The Double Dream of Spring (1915). Showing a monumental figure in front of an easel in an Italian square – a characteristic setting of Chirico – this painting, which dates from the 1940s, marks a return to the theme that the artist conceived in 1914. Aesthetically, the fortune teller is very similar to the prototype of the Trovatori series (1917). The famous figure of the Trovatori is an incarnation of the melancholic poet trapped in a mysterious reality. The Italian critic, Raffaele Carrieri suggested that the artist's interest in this curious, faceless subject was inspired by a play, Les chants de la mi-mort (The Chants of the Half-Dead), written by Chirico's brother and published in the Apollinaire arts magazine, Les soirées de Paris, in the summer of 1914. The play's protagonist is a "voiceless man, without eyes or face" (James Thrall Soby, Giorgio de Chirico, New York, 1966, p. 97). De Chirico himself confirmed that he was inspired by this play: "The idea of these large egg-shaped heads that you also see in my standing mannequins in the metaphysical style, came to me when I saw the replicas created by my brother who had the pseudonym, Alberto Savinio" (Elizabeth Cowling & Jennifer Mundy, On Classical Ground: Picasso, Léger, de Chirico and the New Classicism, 1910-1930, London, Tate Gallery, 1990, p. 81-82). In this painting, Chirico clearly identifies with the character of the fortune teller by placing this character in front of the easel. It is not simply to do with an image inside an image, a recurring motif in art history. Chirico also draws our attention to the artist's creative process and invites the viewer to contemplate the genesis of the artwork as a melting pot of memory, inspiration and premonition. He links the painting to the prophecies of a fortune teller: we must go beyond the blank canvas. Furthermore, the idea of searching for an object's double meaning is at the heart of the surrealists' mission. This figure that inhabits many an artist's painting is joined by other protagonists from De Chirico's world: the empty square, the red tower and not forgetting the ominous shade of an invisible statue. Building on the self-referencing theme of the genesis of a painting and the process of the artist, Il vaticinatore can also be considered as a sort of celebration of perspective, or rather, a parody of it. In fact, the more rational perspective, created by the plan of the arcade on the black board, contrasts with and accentuates the vertiginous quality of the orthogonal lines of the piazza, which seem to tilt the fortune teller and the easel into the foreground. Moreover, the arcades on the black board do not tally with the landscape of the red tower in front of the artist/fortune teller and are therefore a further reminder of the role of memory in the artistic process. Finally, the figure of the mannequin, popularised by De Chirico and the metaphysical painters, marks a return to the grandeur of classical Italian art, which attempts to question the value of objective perception and reveal the enigma of everyday life. 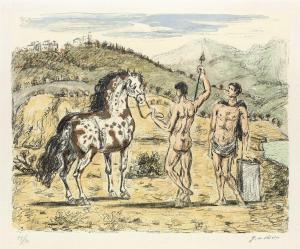 GIORGIO DE CHIRICO I Dioscuri. Color lithograph, 1969. 412x515 mm; 16 1/4x20 1/4 inches, full margins. Signed and numbered 59/90 in pencil, lower margin. With the artist's blind stamp, lower left. Printed by Alberto Caprini, Rome, with the blind stamp lower right. A very good impression with strong colors. Brandani 52. 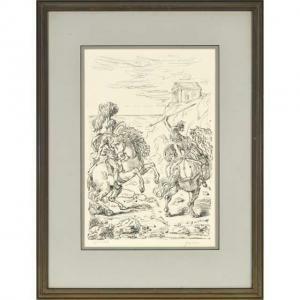 Giorgio de Chirico (1888-1978 Piazza d'Italia signed 'g. 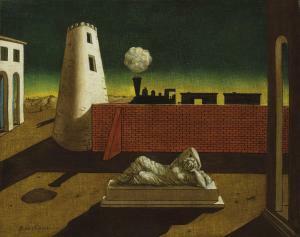 de Chirico' (lower left) oil on canvas 15 3/4 x 19 3/4 in. (40 x 50.1 cm.) Painted in the late 1940s Provenance Galleria Schettini, Milan. Galleria dell'Annunciata, Milan, by 1959. Private collection, Rome, since 1970. Anonymous sale, Bertolami, Rome, 3 June 2014, lot 145. Acquired at the above sale by the present owner.